To say I need energy to work and take care of kids (not that either one on their own isn’t exhausting) is an understatement. From interrupted sleep to demanding time commitments, I’m always looking for a new way to boost energy that doesn’t include caffeine (or a nap). I’ve found that energy bars and granola have a few things in common including protein and healthy fats for sustained fuel and carbs for an immediate energy boost. Fiber is key to satiety and curbing the hunger cravings later on. Granola and bars also provide the ability to be eaten anywhere, from sitting at your desk to taking a quick walk – which also helps boost energy. I’ve been looking for products that not only use nuts, but also use grains other than oatmeal to add variety in flavor, texture and nutrition. One day I would love to make granola or a bar for myself, but until then, I have no problem outsourcing. Thank you to the folks at Purely Elizabeth who were kind enough to volunteer some samples of their delicious granola! From nutty to sweet, to salty, to sweet and salty, there is something to satisfy every craving. Out of the ones I sampled, my favorites are the Chocolate Sea Salt and the Maple Brown Sugar, both of which carry a special probiotic blend for an extra boost towards healthy gut flora and overall health! 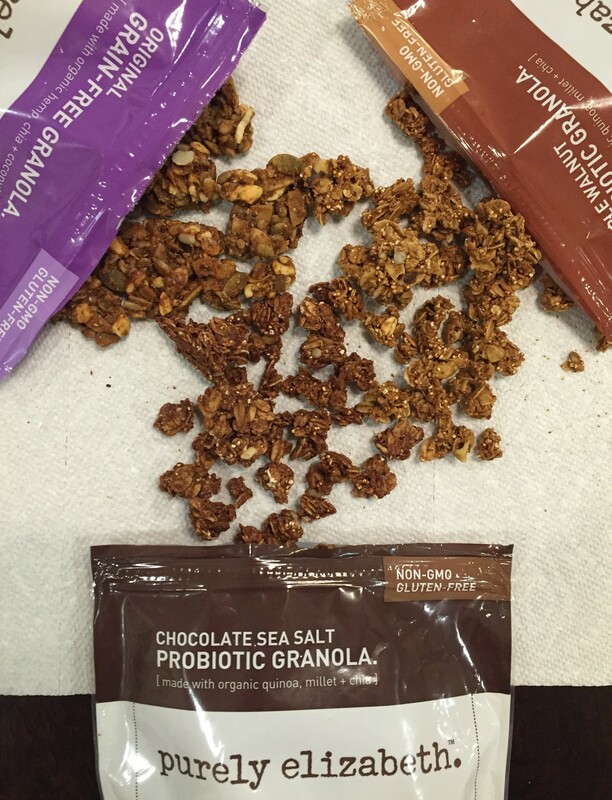 All of the Purely Elizabeth granola is made with non- GMO ingredients and are gluten free. With 130 calories, 3g of protein and 2g of fiber per 1/3 cup serving the pieces are perfect on yogurt, cereal or as I prefer, just by themselves. Be sure to check out their grain-free granola line, especially the Original version. 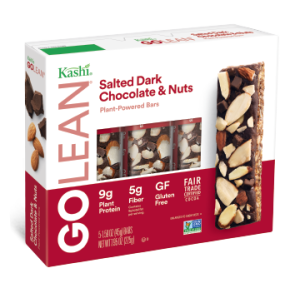 The Kashi brand is overall inspired by heath and their GOLEAN Plant-Powered bars don’t disappoint. I was lucky enough to receive samples of these bars containing various whole grains, seeds and nuts. With 8g of protein, 4g of fiber and 200 calories per bar, they are perfect for a pick me up that will keep me satisfied all afternoon. All of the bars are non-GMO and many are vegan. I can’t decide if my favorite is Salted Dark Chocolate and Nuts or Peanut Hemp Crunch. Or the Dark Chocolate Cashew Chia. Or the Pecan Baklava. My only complaint is that they aren’t sold closer to my apt. 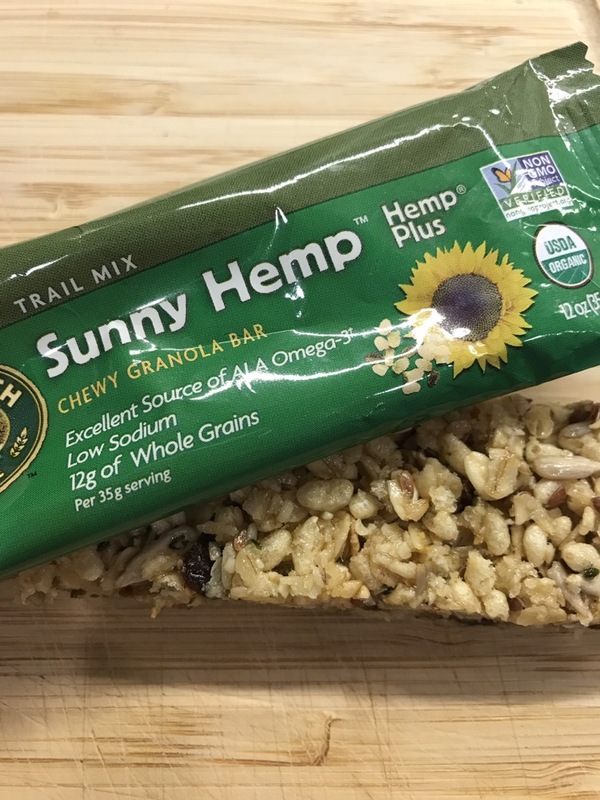 The Sunny Hemp bars are full of sunflower seeds, hemp and raisins and are a little sweeter than some bars, but me and my son are not complaining. The bar is soft which also makes it a good choice for younger kids. With ALA omega-3 fats, 3g of fiber, 3g of protein and 140 calories per bar, it’s a good choice any time of the day. MadeGood Granola bars and minis are are perfect to pack with lunch and are made in a facility free of all the major allergens, including nuts, so they are safe to take to school. 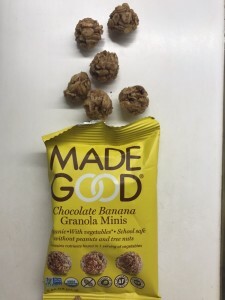 We haven’t tried all of the flavors yet, but the Chocolate Banana Granola Minis are a kid friendly 90 calories per pouch and a hit with family members of all ages! Having a newborn is amazing and overwhelming all at once. With an every-three-hour round the clock schedule of eating, changing and sleeping (for the baby), even a small issue can feel like a big one. With the popularity of breastfeeding, and all of the media messages and random people on the street telling you that you must do it, and having mommy guilt if you don’t, a less than smooth start to nursing can make any new mom frustrated. But, with a positive attitude and a little perseverance, soon you’ll be telling new moms your tips for success! 1. Keep your eye on the prize and understand the benefits. Breast milk is the perfect food for your baby. It is easy to digest and changes from feed to feed to provide exactly what your baby needs. Benefits include fewer ear infections, respiratory infections, stomach viruses and allergic reactions. Pumping and bottle feeding is an excellent option too. Monitor your baby’s feeding cues and if he or she wants to stop eating (won’t latch, turns his or her head away and/or cries if you try to give him or her more) don’t force it. Babies know when they’re full and forcing them to eat more may lead to overweight children because they won’t understand what it means to be “full” and stop eating. 2. Find a support system. This can be your partner, best friend, mom, lactation consultant, a moms group, anyone. Many women quit breastfeeding within the first 10 days due to pain, frustration, exhaustion and just sheer annoyance of having your baby on your breast for up to 8 hours per day (while you’re in pain, frustrated and exhausted). But you and your baby learn more about each other and nursing everyday and then all of a sudden you’re a pro. Talk to your support system and keep nursing. 3. Take a breastfeeding class. Before you have the baby it’s useful to know what to expect. It’s also good to take a class with your baby in the hospital to receive more personalized advice. 4. Make your intentions clear to the nurses in the hospital that you are going to breastfeed. Even if you don’t have your baby in the room every hour of your stay the hospital staff should bring him or her to you when it’s time to eat. 5. Get help. Call a lactation consultant within the first week if nursing isn’t as easy as you anticipated. A lactation consultant can answer all of your questions regarding latch, pain and whether or not your baby is getting enough milk. Call La Leche League, the hospital, your doctor or someone from your support group for a referral. 6. Stick with it. The longer you breastfeed the easier it gets. While it is natural, it’s also something that you and your baby need to learn how to do. But ultimately, decide if breastfeeding is the right choice for you. With formula as a close runner up to breast milk it’s important that you’re happy with your decision of how to feed your baby, whatever that may be. Babies respond to your emotions and should find feeding an enjoyable, bonding experience. If you’re happy at mealtime they will be too, and ultimately a good relationship with your baby is the most important thing. Eating a balanced diet is always beneficial to your health, but if you’re pregnant it’s even more important to be conscious of what you put in your body (and your growing baby’s). These nutrients deserve special attention when you’re expecting. Your blood volume increases up to 50% when you’re pregnant, and iron is necessary to make hemoglobin to support all of the new red blood cells that will bring oxygen to your tissues. Without it you may become anemic and feel tired and fatigued. Iron is also important for your baby- without enough iron, your baby may be at risk for preterm delivery and low birth weight. His or her stores of iron may also run out early in life. Typically iron stores last until ~5-6 months which is why it’s important for first foods to be high in iron. Food sources: lean meats, poultry, fish, beans, spinach, nuts and iron-fortified cereal. To help enhance non-meat sources of iron pair those foods with a food high in vitamin C, such as citrus. Adequate vitamin D helps your baby grow properly and build strong teeth by regulating levels of calcium and phosphorus. A vitamin D deficiency at birth may also put your baby at risk for rickets or bone fractures. The American Academy of Pediatrics recommends all breast fed and formula fed babies who drink less than 32 oz of vitamin D fortified formula per day receive a supplement of 400IU of vitamin D per day. Protein is important to keep your muscles strong and to ensure adequate growth of your baby. Recommended amount: varies per woman based on weight, however a minimum of 80g per day should be a good start. Speak to your MD or RD to determine the best amount for you. Folic acid and folate help prevent neural tube defects (NTDs) such as spina bifida, low birth weight and preterm birth. Most bread products are supplemented with folic acid to prevent NTDs, as the neural tube closes early in pregnancy, possibly before a woman knows she’s pregnant. Supplementation has greatly reduced the number of NTDs in recent years. A new study speculates that adequate amounts of folic acid in the early part of pregnancy may also reduce the risk of autism. It’s a good idea to increase your intake of folic acid before you conceive (if you’re trying). Food sources: leafy greens, chickpeas, beans, peas, asparagus, lentils, seeds, nuts, fortified foods such as breads and pastas. Recommended amount: 800 micrograms per day. Calcium is especially important for mom and baby in the third trimester when your baby’s bones are strengthening at an increased rate. It will also help build strong teeth. Food sources: dairy, almonds, soy, calcium-set tofu, broccoli, Bok choy, kale, fortified foods such as orange juice and soy milk.